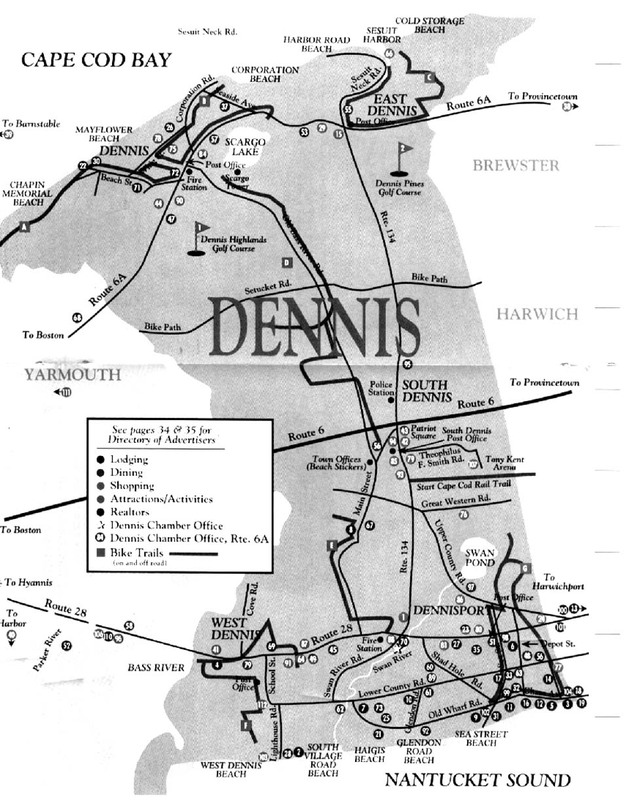 This is a scanned copy of "Map of Dennis," published by the Dennis Chamber of Commerce. A printed copy is the centerfold of the pamphlet, "Dennis, The All-American Town.". Both Setucket Road and Old Bass River Road have excellent paved bike paths which offer lengthy rides of 6 to 8 miles by doubling back. We advise parking at the Dennis Town Offices on Main Street, just south of Route 6; in Dennis Village near Old Bass River Road, off Route 6A; or at the Dennis Senior Center at the intersection of Route 134 and Setucket Road. From Route 6A, Old Bass River Road is steep and to Scargo Hill Road, where the bike path begins. You might want to take a detour one-half mile east on Scargo Hill Road to Scargo Tower, and return.The bike path on Setucket Road begins (or ends) on the east at Quail Hollow Road, and on the west at Mayfair Road. We advise against trying to make a loop by riding Route 6A. It is narrow, dangerous, and heavily traveled. From the Dennis Town Offices, you have a short ride north over the Route 6 overpass to the bike path on Old Bass River Road.